As a descendent of E. King Gill, there may be no more appropriate recipients of the inaugural E. King Gill Award than Jack Little '60 and his wife, Carolyn, who were honored for their lifetime support for Texas A&M athletics during the Aggies' football game vs. Texas on Thanksgiving Night at Kyle Field. The award, which will be presented each year by the 12th Man Foundation, honors those supporters who have generously helped the Foundation realize its mission of "Funding scholarships, programs and facilities in support of championship athletics." In addition, the E. King Gill Award recognizes those who have shown the commitment as a volunteer advocate of the athletic program through exemplary service and leadership while demonstrating a high level of distinction as a role model in career, service and ethics. The Littles were surprised with the announcement in their suite at Kyle Field during halftime of the Kansas game on Nov. 19. "We couldn't be any happier," said Jack Little, former Chair of the 12th Man Foundation's Board of Trustees and retired President and CEO of Shell. "It's quite an honor and was very unexpected. It took me quite a while for it to sink in. "Since I'm not on the Board of Trustees anymore, I wasn't clued in that the award was being instigated. I certainly would not have thought that my name and Carolyn's name would have been at the top of the list. I can think of many other people who are much more deserving for this award. It was just a great thrill to be the recipient of this award. It's quite an honor." Little, who also was the chair of the Foundation's first capital campaign for athletics in 2000, has been a longtime supporter of Texas A&M athletics. 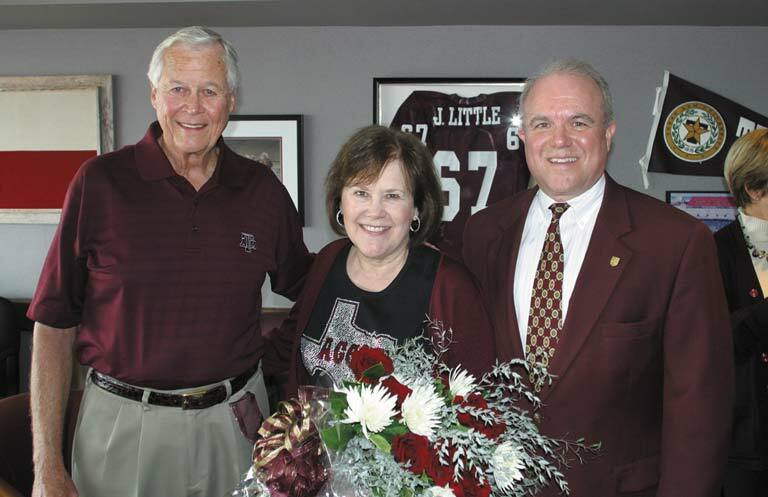 Jack and Carolyn provided the lead gift for the Little Athletic Complex that houses the softball, soccer and track and field facilities on A&M's west campus. The Littles are fixtures at A&M athletic events, and so when a program like Gary Blair's women's basketball team reached the pinnacle of its sport by winning the national championship, there was unfathomable pride to exude. "The experiences of being in a position to see how the athletic program has blossomed in the last 10 years and how we are just excelling in almost every sport…I think the 12th Man Foundation has had a tremendous role to play in addition to Bill Byrne and the athletic department recruiting the coaches," added Little, whose mother was a second cousin of the original E. King Gill. "To see the success we've had on the field of play in really all of our sports, it's just been really rewarding. It gives you a great feeling to know that in some way we've had a little part to play in bringing that about." Carolyn, who wed Jack the summer before his senior year, said no school deserves more support than Texas A&M. "It holds such a special place in both of our hearts," she said. "We're just so happy for the school." A posthumous E. King Gill award also was bestowed upon Col. George J. Eppright, Class of 1926. His great nephew Richard Eppright and his family of Aggies from Fredericksburg accepted the award in his honor during the game on Thanksgiving night. Eppright lived a life of philanthropy, and his beloved Texas A&M University was usually the recipient of his generosity. He made numerous gifts to many areas of the university throughout his lifetime, including six separate endowments to the 12th Man Foundation. He also funded the George Eppright Chair in Aerospace Engineering, endowed the Eppright Award annually honoring A&M's Outstanding International Student and the Eppright Residence Hall was named in his honor. Eppright's final tribute to his alma mater was the largest cash gift in the history of the 12th Man Foundation at that time when, in 1998, he left his estate of more than $4 million to benefit athletic scholarships through the 12th Man Foundation. The Eppright Distinguished Donor Society was named in honor of his generosity, honoring lifetime giving by members of the 12th Man Foundation. "It's quite an honor and was very unexpected. It took me quite a while for it to sink in."